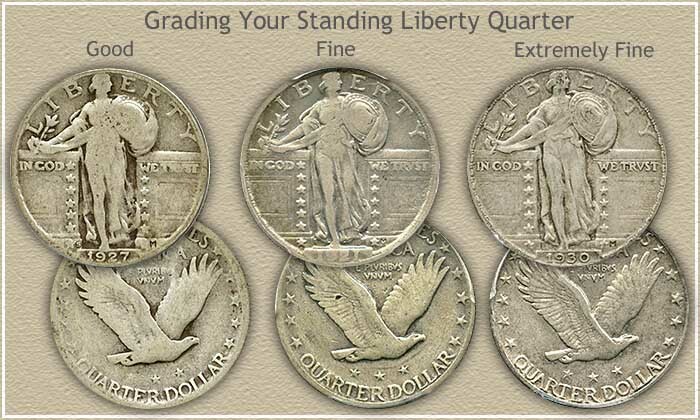 Standing Liberty quarter values begin in the range of $3.42 and above. This is for a common, later date coin in the heavily worn "Good" condition. Not bad, but that is the minimum. Find any Standing Liberty quarter before 1925 with a clearly visible date and your coin is worth $15 to $25. If it is mintmarked "D" or "S" now the value climbs to at least $15 each with most worth much higher. The Uncirculated Standing Liberty quarter pictured because of condition is worth at least $90. See below for more about how to "Grade" the condition of your quarters. Looking for higher values? Find the rarely encountered but exciting, 1923-S... starting value $231. Followed closely by the 1921... starting at $113. Check the value list, a couple of rare dates are amazingly valuable. The following coin values chart shows clearly collectors pay a premium for the higher grade coins. Examine your coins closely for dates, mint marks, and condition. Each plays an important role in determining accurate Standing Liberty quarter values. The above are wholesale Standing Liberty Quarter values. Computed from dealer's price lists with various mark-up factors figured in. They reflect closely the value you would expect to receive when selling. However do expect variations in value to occur subject to subtle grading points, collector demands and dealer needs. For more background information, see how value listings in the above Coin Value Guide are determined. How did your coins compare to the listings? What sets many coins apart is the condition, or how worn it is. Finding a higher grade, better condition coin is your best chance at a rare coin and high Standing Liberty quarter values. Dealers and collectors look at the condition of coins very closely and determine the "Grade". This is done first before determining Standing Liberty quarter values. As a coin circulates and wears each stage is assigned a grade. From heavily worn "Good" condition to one bright and new in "Uncirculated" condition. Compare your coins to the grading images below. Look closely at Liberty holding the shield. A complete shield separates a coin in "Fine" condition from one in a lower grade. On the reverse about half of the feathers of the eagle must show to reach the "Fine" condition. Hopefully some of your coins obtain the higher grades and values. Are one or two coins really nice and you are not sure of the grade? 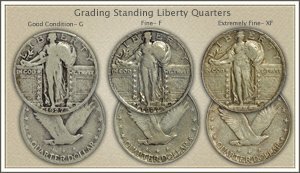 In depth video Grading Standing Liberty Quarters | Video details a step by step process to judge condition and assign a grade. Rare coin and auction listings are very helpful. Look for those offering Standing Liberty quarters for sale. Their listings and prices usually include a notation of the NGC or PCGS assigned grade. Additionally... these coin dealers are potential buyers of your coins. 1916 is the rarest Standing Liberty Quarter. Always in demand by collectors. Always creates excitement when auctioned. Should you have one you are holding a numismatic treasure. Many of the premium value Standing Liberty quarters display the "S" mintmark. It indicates the coin was minted at the San Francisco mint. Locate the "S" just to the left of the date. A magnifying glass makes the job easier. Also, the Denver mint produced Standing Liberty quarters and placed a "D" in the same location. No mintmark for the Philadelphia mint. Your Standing Liberty quarter values are determined by, date, mintmark and condition. Perhaps consider your group of coins as the beginning of a coin collection. The start of an enjoyable and rewarding hobby. If that is not for you, one successful approach is to sell all your coins and use the proceeds to buy one nice rare coin. The one you were hoping to find in the box. One suggestion, a beautiful uncirculated 1925 Standing Liberty quarter. Pass the thrill of a rare coin on to your children. Even though the value of silver forms a nice base to Standing Liberty values, collector demand rules. New collectors pick up the hobby daily, adding to the rising demand and values. Check back whenever you need values, and definitely before your sell. 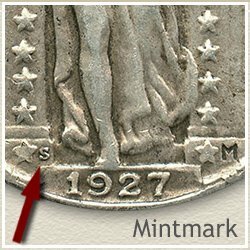 Grading the condition of Standing Liberty quarters is just as important to value as the date and mintmark. Judging condition and assigning a grade is detailed in Video, Descriptions of the important metrics to consider and Images point the locations of areas key to the grade. Print the Coin Values Worksheet - link in navigation column - to list your Standing Liberty quarters and record their values. Should you decide to sell... use the worksheet as an invoice and packing slip when sending coins through the mail to dealers. It indicates you have done your coin values homework.